I spent a day with the Suicide Squad, but I didn’t go to the movie theater to do so. Instead, I read a big fat collection presenting earlier incarnations of the concept. In these earliest versions, there were a lot more dinosaurs. Suicide Squad: The Silver Age Omnibus Volume 1 by Robert Kanigher, Ross Andru, Mike Esposito and a few other creators [DC; $49.99] is a hardcover collection of the adventures that appeared in The Brave and the Bold and eleven later tales from Star Spangled War Stories. The two runs are as different from each other as they are from the cinematic and modern comics versions of the franchise. The original Suicide Squad, also known as Task Force X, consisted of pilot/leader Rick Flagg, space medicine nurse Karin, physicist Doc Evans and astronomer Jess. They were trained to handle anything that came their way. What came their way were situations too weird and dangerous for other teams, situations that involved an alarming number of dinosaurs. In the late 1950s through the mid-1960s, kids and, specifically, kids who bought comics, loved dinosaurs. Characters created by writer Kanigher almost always have traumatic back stories. Each member of the Squad had been the only survivor – in the case of Doc and Jess, survivors – of missions/experiments that went horribly wrong. Rick and Karin were in love, but, as Doc and Jess also longed for Karin, they didn’t act on their desires to preserve the smooth functioning of the team. The “sole survivors” bit was only mentioned a few times, but the love quadrangle, that was mentioned in every Suicide Squad tale in The Brave and the Bold #25-27 and #37-39. With the art team of Andru and Esposito, Kanigher filled those six issues with wildly imaginative menaces. There were giant monsters from space, from ancient legends and from mad science experiments. There was an alien spaceship build to look like a giant dinosaur. There were evil Communists bent on conquering America, though they were never specifically said to be Communists. (But we kids of the Cold War, we knew who they were.) There was the sinister Sculptor Sorcerer, a spiffy super-criminal who really deserves to appear in some modern-day DC Comics title. Andru and Esposito? I loved their work then and now. They drew some of the most beautiful women in comics and Karin is certainly among them. I remember being fascinated by her blonde hair, tight as the Comics Code would allow sweaters and pencil skirts, and those high heels perpetually dangling off one of her feet in moments of peril. She even wore that outfit under her jump suit. The male members of the Squad were rock-jawed and somewhat stocky. It’s as if they were chiseled from living marble, but with none of the stiffness of unyielding stone. The dinosaurs and other creatures? The Andru/Esposito touch could be seen as soon as you walked into a drug store and headed for the comic-book displays. They were masters of the medium and very few artists of that era could match their excellence. Though the name “Suicide Squad,” the lovely Karin and the hard-as-nails Rick Flagg all lived on when Amanda Waller created her 1980s black ops team of troubled heroes and villains seeking pardons for their crimes, the original version of Task Force X was not a sales success. 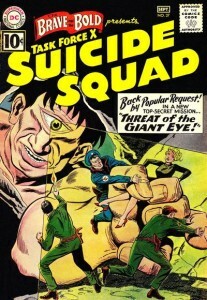 The first three “tryout” issues apparently did well enough to earn the Suicide Squad a second “tryout,” the very human heroes failed to earn their own ongoing book in a DC Universe that already had the Blackhawks, the Challengers of the Unknown, the Sea Devils and time master Rip Hunter’s team of history-traveling adventurers. 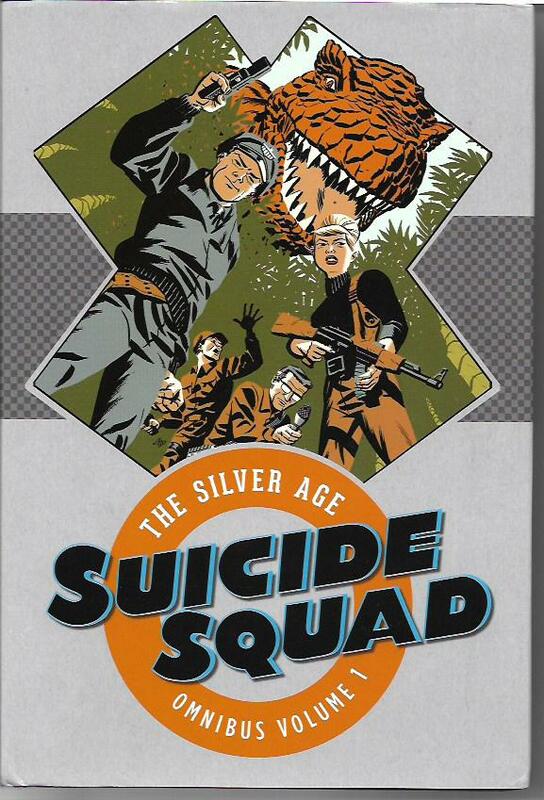 Not even the dinosaurs could sell enough comic books to keep this first Suicide Squad in action. But writer/editor Kanigher must have liked the way “Suicide Squad” rolled off his typewriter. When his Star Spangled War Stories went from French Resistence warrior Mademoiselle Marie to G.I.s battling dinosaurs in the improbable “The War That Time Forget” series, he used the name or variations of the name in eleven stories. All but one of these stories were written by Kanigher and all but two were drawn by Andru and Esposito. You men of the Suicide Squad have been uniquely trained for special missions from which no regular combat soldier could hope to return! Indeed, members of this squad were said to be able fire any weapon, drive any vehicle, fly any aircraft, perform any combat task, bring home the bacon, fry it up in a pan and so on. The last two are just my dumb jokes. They would have fried up that bacon in their “steel pots,” i.e., their helmets. The first two Squad members we meet are Morgan and Mace, neither of whom is playing with a full deck of cards. Morgan hates Mace with a fanatical passion because Mace was the surviving member of a two-man Olympics toboggan team that had a fatal crash. The athlete who died was Morgan’s brother. So, in scene after scene, even when they are facing death on a mission, Morgan is aiming his weapon at Mace. He threatens to shoot him and occasionally does fire a shot at him. Consumed by guilt, Mace takes this crap when any sane person would feed Morgan to a dinosaur. The duo would appear in four stories. Three of them feature “Baby Dino,” a flying dinosaur who befriends them and who Morgan also wants to shoot, while their last adventure introduces the never-to-be-seen again Caveboy. The “enemies forced to team up” bit gets used a few more times in this run of Suicide Squad stories. There’s the Sheriff and the Wild One, a lawman and the young criminal he once arrested. There’s the Stoner brothers, one a police officer and the other a fugitive from the law. There are two soldiers who knew each other as teenagers, one from the wrong side of the tracks and the other from the right side of the tracks. Maybe the most chilling of the Suicide Squad tales is “The Monster that Sank a Navy,” the last Kanigher/Andru/Esposito collaboration. We see the devastating effect facing off against dinosaurs has on the mind of one soldier. Andru and Esposito deliver unforgettable images in their farewell to the series. One of the other stories is drawn by Joe Kubert. 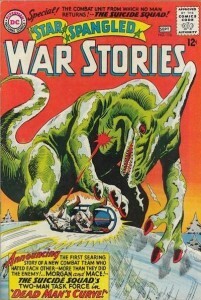 The last story in this collection is written by Howard Liss and drawn by Gene Colan. All in all, this omnibus edition presents 336 pages of great comics from the Silver Age of Comics. If you were around when these tales were first published, you’ll probably get a kick out of them again. If you weren’t around, you have fun reading ahead of you. I award Suicide Squad: The Silver Age Omnibus Volume 1 my highest recommendation. Why else would I devote an entire column to it?